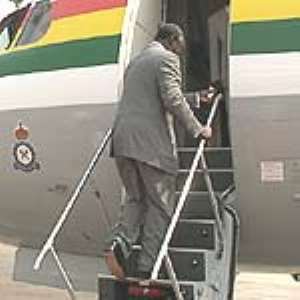 Accra, May 29, GNA- President john Agyekum Kufuor left Accra this afternoon for Malabo, Equatorial Guinea for a three-day official visit. Senior officials of the Ministry of Foreign Affairs accompanied him. During a press briefing, Mr Kwabena Agyepong, Presidential Spokesperson who is also on the trip said the visit, which is a reciprocal one, would afford the two presidents the opportunity to discuss bilateral issues, including ways of deepening economic relations between the two countries. He said the two presidents would also review the general security situation in the West African sub-region. Mr Kwabena Agyapong said the President would also meet the Ghanaian community in the country. At the airport to see off the president were the Vice President Alhaji Aliu Mahama, some Ministers of State as well as the Dean of the Diplomatic Corps, Mr Ibrahim Omar.